InnovateHER, from the Small Business Administration (SBA) is a cross-cutting prize competition to unearth innovative products and services that help impact and empower the lives of women and families. Entrepreneurs selected as winners in local competitions will advance to the semi-final round. From the pool of semifinalists, SBA will select up to 10 finalists who will be invited to the National InnovateHER: Innovating for Women Business Challenge. The finalists will pitch their products and ideas to a panel of expert judges and compete for the top three awards and a total of $70,000 in prizes. • Fills a need in the marketplace (30%). If you are up for the challenge, STEP 1 is to enter a local competition. To enter the competition at Brookdale Community College in Lincroft, NJ, submit your business plan per the Challenge Criteria to mosbdc@brookdalecc.edu by May 17, 2017. Finalists will be notified on May 24, 2017. The top 5 selected finalists will pitch to the panel on June 2, 2017. Entrepreneurs selected as winners in local competitions will advance to the semi-final round. 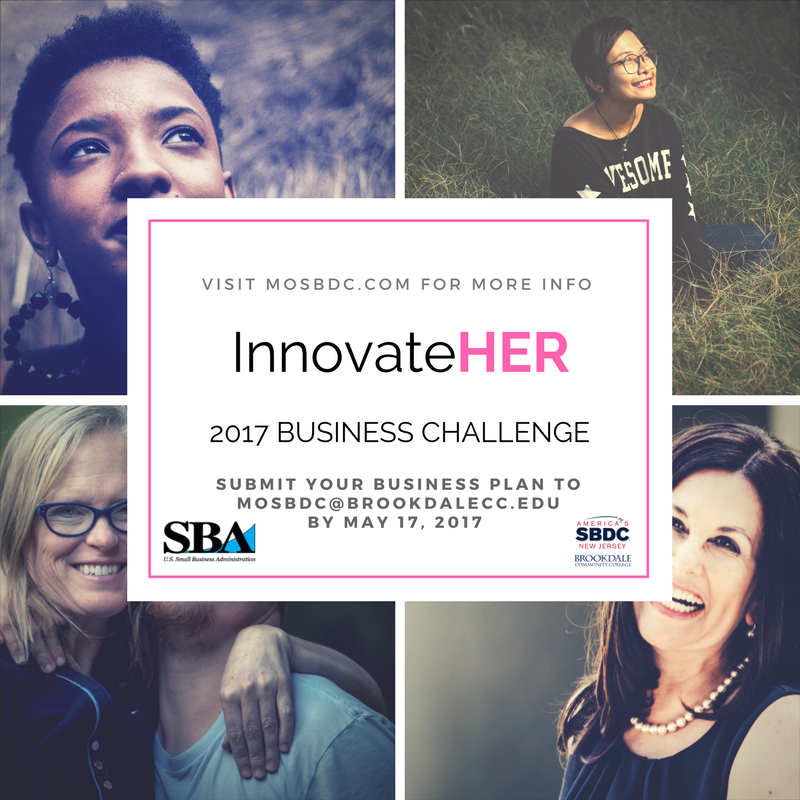 From the pool of semifinalists, SBA will select up to 10 finalists who will be invited to the National InnovateHER: Innovating for Women Business Challenge to be held in mid-2017. The finalists will pitch their products and ideas to a panel of expert judges and compete for the top three awards and a total of $70,000 in prizes. Women are in the workforce now more than ever, a number that is close to surpassing that of men. Gender equality is not simply about getting a woman a spot at the metaphorical table. Women have made great strides in education, the workforce, and their role in the economy, but there are still not enough women in leadership positions. SBA recognizes that over the past two decades, women entrepreneurs have been critical to growing businesses and creating jobs, whether it’s in in cutting-edge fields like precision medicine or cybersecurity or through advances in agriculture or manufacturing. Consider this: the number of women venture capital partners has dropped to 6 percent in 2014, down from 10 percent in 1999. This directly correlated with women’s access to capital; only about 7 percent of venture capital funding in the United States goes to women. A Harvard Business School study asked potential investors to rate a series of pitches, some of which were narrated by women and some by men. Even when the scripts were exactly the same, only 32 percent of people said they’d fund the woman, compared to 68 percent who said they would fund the man. 1. What is the purpose of the Challenge?  The SBA launched the first InnovateHER Challenge in February 2015 with the goal of unearthing products and services across the U.S. that help impact and empower the lives of women and families.  We know that our workforce looks very different from 50 years ago. Women now make up nearly half of the labor force and play a critical role in our nation’s economic prosperity. Most children live in households where all parents work. And as our population ages, families are increasingly caring for aging parents while balancing the needs of work and home.  As the demands on women and families grow, the need for products and services that address these unique challenges increases. The InnovateHER Challenge provides that platform. 2. What are the Challenge criteria? (3) fills a need in the marketplace (30%). 3. How does the Challenge work?  The Challenge will take the form of local competitions that will be run across the country beginning as early as December 29, 2016 and ending no later than June 3, 2017. These local competitions will be hosted by organizations such as universities and colleges, incubators, accelerators, clusters, scale-up communities, SBA Resource Partners. See Question 14 for more information if your organization is interested in hosting a local competition. All host organizations must be approved by SBA, and all local InnovateHER competitions must be conducted in a manner that is consistent with the Challenge Rules as defined by SBA.  Following the completion of the local competitions, but no later than June 3, 2017, each host organization will identify one winner that will advance to the semi-final round of the Challenge. In the case of a winning team, the host organization must provide the name of the team’s self-identified project lead as the winner who will advance to the semi-final round. On or before June 23, 2017, the host organizations will submit the name of the winner along with a Nomination Package containing a business plan and other required information to SBA via www.Challenge.gov. See Question 16 for the full requirements of the Nomination Package.  In the semi-final round of the Challenge, SBA will review the Nomination Packages submitted by the local host organizations and select up to 10 Finalists.  The Finalists will be offered the opportunity to make a live marketing pitch to a panel of expert judges drawn from the private sector and compete for up to $70,000 in cash prizes, donated by the Sara Blakely Foundation.  The panel of judges will select a 1st, 2nd, and 3rd place winner whose pitches best satisfy the Challenge criteria and present the greatest potential for success. 4. Where can I find a complete list of the Challenge Rules?  The Challenge Rules are posted at www.Challenge.gov. 5. Who is eligible to participate in the Challenge?  This Challenge is open only to: (1) citizens or permanent residents of the United States who are at least eighteen (18) years of age at the time of their submission of an entry (or teams of such individuals); and (2) private entities, such as corporations or other organizations, that are incorporated in and maintain a primary place of business in the United States.  Individuals submitting on behalf of corporations, nonprofits, or groups of individuals (such as an academic class or other team) must meet the eligibility requirements for individual contestants. An individual may belong to more than one team submitting an entry in this Challenge.  SBA employees are not eligible, nor are Federal entities or Federal employees acting within the scope of their employment.  Individuals or organizations that are currently suspended or disbarred by the federal government are not eligible for this Challenge. 6. How do I enter the Challenge as a contestant?  The only means of entering the InnovateHER Challenge is through a local competition run by an approved host organization. Contestants cannot submit entries directly to SBA.  Local competitions can be held anytime between December 29, 2016 and June 3, 2017. The application process for the local competition will vary depending on your local host organization. For more information regarding these local competitions, please visit sba.gov/InnovateHER. SBA will periodically update this list as host participation is confirmed. 7. Is there an entry fee for the Challenge?  There is no entry fee to participate in the Challenge. 8. What is an example of a product or service for women families?  Bluetooth that looks like a designer bracelet. 9. Who were the Top 3 Winners of the 2015 InnovateHER Challenge? 1st place – Bethany Edwards, Pregnancy Test, Philadelphia, Pa.
LIA Diagnostics has designed a pregnancy test to provide a better experience for women at a stressful moment in their lives. The LIA test is discreet, easy to use and is environmentally friendly. Unlike current tests, LIA is flushable, ergonomically designed for women to hold and use, and displays a result that is easy to understand. 2nd place – Lisa Crites, The Shower Shirt, Cocoa Beach, Fla. The SHOWER SHIRT™ is a post-surgical, patented, water-resistant garment designed to prevent post-surgical mastectomy drain sites from coming into contact with water while showering. With the creation of The SHOWER SHIRT, women now have the option to shower safely, while also reducing their risk of post-surgical infections. 3rd place – Sophia Berman, Trusst Lingerie, Pittsburgh, Pa.
Trusst Lingerie has developed effective and attractive products aimed at eliminating the pain and discomforts experienced by the underserved U.S. market of larger busted woman with cup size DDD+. Current bra technology supports larger breasts from the shoulder straps. Trusst’s cantilevered system places the majority of the support from underneath the bust, encompassing up to 80 percent of breast weight. 10. Who were the Top 3 Winners of the 2016 InnovateHER Challenge? 1st place – ($40,000) was awarded to Elizabeth Caven, creator of UpCraft Club. UpCraft Club is a website for digital sewing patterns. Caven is based in Des Moines, Iowa. 2nd place – ($20,000) was awarded to Dawn Dickson, who has created Flat Out of Heels – durable roll-out ballet flat-type shoes that provide an option for heel-wearing ladies on the go. Dickson is based in Miami Beach, FL. 3rd place – ($10,000) went to Dr. Agnes Scoville for her product Pacidose, a device which makes it easier to give medicine to infants and young children. Dr. Scoville is located in St. Louis, MO. 11. Is the Challenge only open to women?  The Challenge is open to both men and women who meet the eligibility criteria outlined above. 12. Can I enter the Challenge as a group or a team?  Yes. Individuals submitting on behalf of corporations, nonprofits, or groups of individuals (such as an academic class or other team) must meet the eligibility requirements for individual contestants outlined above. An individual may belong to more than one team, corporation, or nonprofit organization submitting an entry in this Challenge.  Following the completion of the local competitions, each host organization will identify one winner that will advance to the semi-final round of the Challenge. For a winning entry that has been submitted by a team of competitors, the host organization must list the team’s self-identified project leader as the winner who will advance to the semi-final round. 13. I’m interested in entering a local InnovateHER competition. How can I find a list of approved host organizations for the Challenge?  SBA will post the names of all approved local hosts on a rolling basis at sba.gov/InnovateHER as SBA confirms their participation. 14. What do winners of the local competitions receive?  Each winner submitted by an approved local host will have the opportunity to advance to the semi-final round of the Challenge.  In the semi-final round, SBA will review the semi-finalist nomination packages submitted by the local competition host organizations and select up to 10 Finalists. The Finalists will be offered the opportunity to participate in the InnovateHER Final Challenge to be held on September, 2017, where they will make a live marketing pitch to a panel of expert judges drawn from the private sector and compete for up to $70,000 in cash prizes. 15. My organization is interested in hosting a local competition. What is the process? c. The name of the organization’s designated Point of Contact (POC) for the local competition, his/her email address, and phone number.  SBA will evaluate all requests to host a local InnovateHER local competition in its sole discretion and will confirm a host’s participation in writing.  Additionally, with some exceptions, organizations that wish to host an InnovateHER local competition will be required to agree to the terms of a Cosponsorship Agreement with the SBA that outlines the terms of the parties’ relationship for the purposes of InnovateHER.  SBA will notify prospective hosts if such agreement is required. 16. When is the deadline for an organization to make a request to host a local InnovateHER competition under this Challenge?  April 19, 2017 is the last day to submit a request to SBA to host a competition in connection with this Challenge. See Question 14 for the requirements. 17. My organization has been approved by the SBA to host a local InnovateHER competition. What is the process for holding a competition and selecting winner?  Once approved, host organizations may hold a local InnovateHER competition anytime starting December 29, 2016 and ending no later than June3, 2017.  It is up to each host organization to determine the type of local competition, conducted in a manner that is consistent with the Challenge Rules, that will best identify the most innovative and entrepreneurial business ideas, including the type of application that individuals need to prepare in order to compete.  At a minimum, however, each application must contain a business plan covering the contestant’s proposed product or service and must satisfy the Challenge criteria identified by SBA in the Challenge Rules and Question 2 above.  The local competitions will be administered solely by the local host organizations and will be judged by individuals selected by each host in their sole discretion. However, no individual acting as a judge at any stage of this Challenge may have personal or financial interests in, or be an employee, officer, director, or agent of any contestant or have a familial or financial relationship with a contestant.  Host organizations will also publicize the competition locally. Host organizations should notify SBA of the date and location of the local competitions for the purposes of publication at www.sba.gov/InnovateHER. (iii) A concise, two-sentence description of the product or service (Note: this description may also be also in promotional or informational materials in connection with InnovateHER). c. A signed Statement of Support prepared by the host organization that explains why the winner of the local competition best satisfied the Challenge criteria and presented the greatest potential for success (maximum length: 2 pages).  Each host organization is responsible for preparing the complete Nomination Package, including obtaining a copy of the relevant Business Plan from the winner and ensuring that the full package is timely submitted to the SBA via the www.Challenge.gov website.  SBA will reject any nomination package submitted to the SBA by an organization that has not been officially approved by SBA to participate in the InnovateHER Challenge. 18. Once my organization submits a Nomination Package for a semi-finalist winner, what is the process for selecting Finalists?  In the semi-final round of the Challenge, SBA will review the Nomination Packages submitted by the local competition host organizations and select up to 10 Finalists whose products or services, in SBA’s sole judgment, best satisfy the Challenge criteria and present the greatest potential for success.  In addition, in order to achieve nationwide distribution of prizes for the purpose of stimulating the growth and development of new products and services across the entire United States and across a diverse range of project types, SBA may take into account nominees’ geographic locations when selecting winners, including support to geographic regions that traditionally have limited access to capital, as well as diversity in the types of products and services.  Finalists selected by SBA will be required to sign a form certifying that they meet the eligibility requirements identified in Paragraph 2 above and have complied with these Challenge Rules. SBA may work with the host organization to help obtain this certification.  Each Finalist will be offered the opportunity to participate in the InnovateHER Final Challenge to be held in September, 2017, where they will make a live marketing pitch to a panel of expert judges drawn from the private sector.  The panel of judges from the private sector will select the three Finalists whose pitches, in their sole judgment, best satisfy the Challenge criteria and present the greatest potential for success and rank them in descending order.  Finalists will be responsible for covering their own travel costs for the national competition. 19. Can an organization submit a nomination package directly to SBA without holding a business competition?  No. The selection of a local winner from the first round of the Challenge must result from a local business competition.  Each host organization will determine the type of local competition that best identifies the most innovative and entrepreneurial business ideas, including the type of application that individuals need to prepare in order to compete.  At a minimum, however, each application must contain a business plan covering the contestant’s proposed product or service and must satisfy the Challenge criteria outlined by SBA above.  Additionally, contestants cannot submit entries directly to SBA.  See Question 16 for more details on how local competitions will select a winner. 20. Will any expenses incurred for the Challenge (i.e., expenses spent to build product/service travel costs to location of local competition and or final Challenge, etc.) be reimbursed?  No expenses will be reimbursed by SBA for this Challenge.  Challenge Finalists will be responsible for covering their own travel costs for the InnovateHER Finals. 21. Will SBA retain nomination packages?  All nomination packages and related materials provided to SBA in the semi-final and final rounds of the Challenge automatically become SBA records and cannot be returned. Contestants should identify any confidential commercial information contained in their entries at the time of their submission to the local Host Organization. SBA will notify contestants of any Freedom of Information Act requests the Agency receives related to their submissions in accordance with 13 C.F.R. Part 102. 22. When will the InnovateHER Finalists be announced?  On July 31, 2017 SBA will notify the InnovateHER Finalists via email, and announce them at sba.gov/innovateHER. 23. When/where will the InnovateHER Finals be held?  The InnovateHER Final Challenge will be held in September, 2017, location TBD. The top three winners of InnovateHER 2017 will be announced that day. 24. Will my expenses be paid for if I am a Finalist invited to Washington, D.C?  Finalists will be responsible for covering their own travel for the national Challenge. No expenses will be reimbursed by SBA for this Challenge. 25. Will prize money be awarded as part of the final round of the Challenge? 26. How will intellectual property be treated under this Challenge?  All entries submitted in response to this Challenge will remain the sole intellectual property of the individuals or organizations that developed them.  By registering and entering a submission, each contestant represents and warrants that it is the sole author and copyright owner of the submission, and that the submission is an original work of the contestant, or if the submission is a work based on an existing application, that the contestant has acquired sufficient rights to use and to authorize others to use the submission, and that the submission does not infringe upon any copyright or upon any other third party rights of which the contestant is aware. 27. Will participants be compensated or provided with other consideration as part of publicity for the event?  No. By registering and entering a submission, each contestant consents to SBA’s and it agents’ use, in perpetuity, of its name, likeness, photograph, voice, opinions, and/or hometown and state information for promotional or informational purposes through any form of media, worldwide, without further payment or consideration. 28. Under what legal authority is SBA conducting this Challenge?  This Challenge is being conducted by SBA pursuant to the America Competes Act (15 U.S.C. § 3719) and is subject to all applicable federal laws and regulations. By participating in this Challenge, each contestant gives its full and unconditional agreement to the Challenge Rules and the related administrative decisions described in this notice, which are final and binding in all matters related to the Challenge. A contestant’s eligibility for a prize award is contingent upon their fulfilling all requirements identified in this notice. All prize monies are funded through private sector sources. The private sector source is liable to the winners for payment of the prize. SBA, however, will coordinate with the private sector source regarding instructions for award of the prize purse. SBA reserves the right to modify or cancel this Challenge, in whole or in part, at any time prior to the award of prizes. 29. How can I learn more about the Challenge?  Visit www.sba.gov/InnovateHER for more information. 2. Eligibility Rules for Participating in the Challenge: This Challenge is open only to: (1) citizens or permanent residents of the United States who are at least eighteen (18) years of age at the time of their submission of an entry (or teams of such individuals); and (2) private entities, such as corporations or other organizations, that are incorporated in and maintain a primary place of business in the United States. Individuals submitting on behalf of corporations, nonprofits, or groups of individuals (such as an academic class or other team) must meet the eligibility requirements for individual contestants. An individual may belong to more than one team submitting an entry in this Challenge. SBA employees are not eligible, nor are Federal entities or Federal employees acting within the scope of their employment. Individuals or organizations that are currently suspended or disbarred by the federal government are not eligible for this Challenge. 3. Registration Process for Participants: The Challenge launched on December 29, 2016. The initial round of the Challenge will take the form of local competitions that will be run across the country beginning no earlier than December 29, 2016, and ending no later than June 3, 2017, by host organizations such as universities, accelerators, clusters, scale-up communities, SBA Resource Partners. For more information regarding these local competitions as it becomes available, please visit sba.gov/InnovateHER. SBA will continue to update the list of local competitions as details are confirmed. While these local competitions will be identified as part of the national InnovateHER Challenge and will be conducted in a manner that is consistent with these Challenge Rules, they will be administered solely by the local host organizations and will be judged by individuals selected by each host in their sole discretion. At a minimum, however, each application must contain a business plan covering the contestant’s proposed product or service and must satisfy the Challenge criteria identified by SBA in Paragraph 1 above. Following the completion of the local competitions, each host organization will identify one winner that will advance to the semi-final round of the Challenge. For a winning entry that has been submitted by a team of competitors, the host organization must list the team’s self-identified project leader as the winner who will advance to the semi-final round. No later than June 23, 2017 each host organization will submit a nomination package to www.Challenge.gov containing the winning individual/team’s business plan and other required information to SBA, which will administer the semi-final and final rounds of the Challenge. Selection as a semi-finalist following a local competition is the only means of registering for the Challenge. All nominations will be screened by SBA for eligibility. Contestants cannot submit entries directly to SBA. SBA will evaluate all requests to host a local InnovateHER competition in its sole discretion and will confirm a host’s participation in writing. Additionally, with some exceptions, organizations that wish to host an InnovateHER local competition will be required to agree to the terms of a Cosponsorship Agreement with the SBA that defines the scope of the relationship for the purposes of InnovateHER and outlines the co-promotion and marketing terms. SBA will notify prospective hosts if such agreement is required. SBA will reject any nomination package submitted to the SBA by an organization that has not been officially confirmed by SBA to participate in the InnovateHER Challenge. Each host organization will determine the type of local competition, conducted in a manner that is consistent with these Challenge Rules, that will best identify the most innovative and entrepreneurial business ideas, including the type of application that individuals need to prepare in order to compete. At a minimum, however, each application must contain a business plan covering the contestant’s proposed product or service and must satisfy the Challenge criteria identified by SBA in Paragraph 1 above. The local competitions will be administered solely by the local host organizations and will be judged by individuals selected by each host in their sole discretion. However, no individual acting as a judge at any stage of this Challenge may have personal or financial interests in, or be an employee, officer, director, or agent of any contestant or have a familial or financial relationship with a contestant. Host organizations will also publicize the competition locally. Host organizations should notify SBA of the date and location of the local competitions for the purposes of publication at www.sba.gov/InnovateHER. No later than June 3, 2017, host organizations can hold local competitions. A signed Statement of Support prepared by the host organization that explains why the winner of the local competition best satisfied the Challenge criteria and presented the greatest potential for success (maximum length: 2 pages). Each host organization is responsible for preparing the complete Nomination Package, including obtaining a copy of the relevant Business Plan from the winner and ensuring that the full package is timely submitted to the SBA via the www.Challenge.gov website. Semi-Final Round – In the semi-final round of the Challenge, SBA will review the semi-finalist nomination packages submitted by the local competition host organizations and select up to 10 Finalists whose products or services, in SBA’s sole judgment, best satisfy the Challenge criteria identified in Paragraph 1 of these Rules and present the greatest potential for success. In addition, in order to achieve nationwide distribution of prizes for the purpose of stimulating the growth and development of new products and services across the entire United States and across a diverse range of project types, SBA may take into account nominees’ geographic locations when selecting winners, including support to geographic regions that traditionally have limited access to capital, as well as diversity in the types of products and services. Finalists selected by SBA will be required to sign a form certifying that they meet the eligibility requirements identified in Paragraph 2 above and have complied with these Challenge Rules. Final Round – Each finalist will be offered the opportunity to participate in the InnovateHER Final Challenge to be held in September 2017, where they will make a live marketing pitch to a panel of expert judges drawn from the private sector. The panel of judges will select the three finalists whose pitches, in their sole judgment, best satisfy the Challenge criteria and present the greatest potential for success and rank them in descending order. Finalists will be responsible for covering their own travel costs for the national competition. This Challenge is being conducted by SBA pursuant to the America Competes Act (15 U.S.C. § 3719) and is subject to all applicable federal laws and regulations. By participating in this Challenge, each contestant gives its full and unconditional agreement to the Challenge Rules and the related administrative decisions described in this notice, which are final and binding in all matters related to the Challenge. A contestant’s eligibility for a prize award is contingent upon their fulfilling all requirements identified in this notice. Publication of this notice is not an obligation of funds on the part of SBA. All prize monies are funded through private sector sources. The private sector source is liable to the winners for payment of the prize. SBA, however, will coordinate with the private sector source regarding instructions for award of the prize purse. SBA reserves the right to modify or cancel this Challenge, in whole or in part, at any time prior to the award of prizes. 8. Conflicts of Interest: No individual acting as a judge at any stage of this Challenge may have personal or financial interests in, or be an employee, officer, director, or agent of any contestant or have a familial or financial relationship with a contestant. 9. Intellectual Property Rights: All entries submitted in response to this Challenge will remain the sole intellectual property of the individuals or organizations that developed them. By registering and entering a submission, each contestant represents and warrants that it is the sole author and copyright owner of the submission, and that the submission is an original work of the contestant, or if the submission is a work based on an existing application, that the contestant has acquired sufficient rights to use and to authorize others to use the submission, and that the submission does not infringe upon any copyright or upon any other third party rights of which the contestant is aware. 10. Publicity Rights: By registering and entering a submission, each contestant consents to SBA’s and its agents’ use, in perpetuity, of its name, likeness, photograph, voice, opinions, and/or hometown and state information for promotional or informational purposes through any form of media, worldwide, without further payment or consideration. 11. Liability and Insurance Requirements: By registering and entering a submission, each contestant agrees to assume any and all risks and waive claims against the Federal Government and its related entities, except in the case of willful misconduct, for any injury, death, damage, or loss of property, revenue, or profits, whether direct, indirect, or consequential, arising from their participation in this Challenge, whether the injury, death, damage, or loss arises through negligence or otherwise. By registering and entering a submission, each contestant further represents and warrants that it possesses sufficient liability insurance or financial resources to cover claims by a third party for death, bodily injury, or property damage or loss resulting from any activity it carries out in connection with its participation in this Challenge, or claims by the Federal Government for damage or loss to Government property resulting from such an activity. Contest winners should be prepared to demonstrate proof of insurance or financial responsibility in the event SBA deems it necessary. 12. Record Retention and Disclosure: All nomination packages and related materials provided to SBA in the semi-final and final rounds of the Challenge automatically become SBA records and cannot be returned. Contestants should identify any confidential commercial information contained in their entries at the time of their submission to the local Host Organization. SBA will notify contestants of any Freedom of Information Act requests the Agency receives related to their submissions in accordance with 13 C.F.R. part 102.